How to Answer: Why are Bellydancers So Expensive? Why are bellydancers so expensive? I know that bellydancers struggle with this question time and time again. And rather than go on a rant about it, I have decided to help you answer this question for your clients. To help you, as a dancer, be able to give a great answer without getting emotional and without justifying yourself with a laundry list of items. Feel free to use this article as a reference for when you receive this question! 1. I am a luxury item. Bellydancers are not something that everyone can afford. Those that call us have to understand that. Similar to the difference between a compact car and a luxury car. We cost a little more but we give a whole lot in return! 2. This is a business. Your price is not a random number. It was created to cover all of the expenses involved in your business and so that you can make a living. Do not go into detail. All you need to say is that the price that you have come up with covers your services and the cost of running your business. 3. I do not compare myself to other dancers. This is a great way to squash the “so and so said they would do it for 150” I understand that the other performer is offering her services for 150. I am unable to do so. If you would like me to perform, then this is my rate. I do not compare my rates to that of other dancers. If you would like to proceed with booking the other dancer, feel free. I have given you the best price commiserate with the quality of my services. 4. Professionalism guarantee. 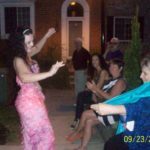 When you hire me, you are guaranteed a professionally dressed, fully prepared dancer who will wow and dazzle your audience. I will be on time and courteous to you and all of your guests. 5. Additional unique facts. I mention that I have awards and have been on TV. For you, it could be a specific prop that you do that is unique, a skill that you have, or something tangible that they can visualize. It does not mean go into all of the year of training or with whom you have studied, but give them something easily associated with your price tag. I hope that you are able to use this framework in your responses to this question. If you have anything to add feel free to comment below. We could all use as much additional information as possible in the quest to keep our rates at a living wage.